Clifton Forge, VA (April 11, 2019) - The Clifton Forge Rescue Squad has made a donation to the 23rd annual Alleghany Highlands Bike Rodeo. The bike rodeo will be held at the Jackson River Sports Complex in Covington on May 4th. 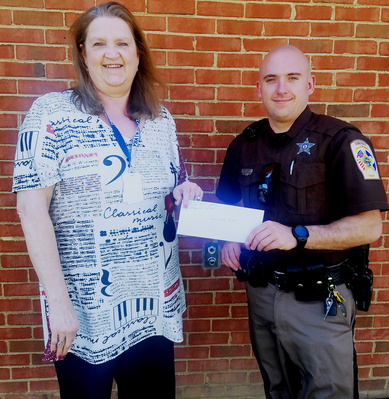 Presenting a check to Deputy Robert Dudley of the Alleghany County Sheriff's Office, is Teresa Gibson, Treasurer of the Clifton Forge Rescue Squad.